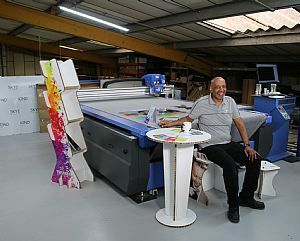 When TriStar Printers Ltd exited the downturn amongst a flooded and cut-throat traditional small format litho industry, the Blackburn print company re-aligned its business strategy in a concerted effort to add value for its customer base. This strategy involved adding 40% to its floor area to house a large format print department with a Canon Océ Arizona flatbed digital printer and alongside it a DYSS X7 digital cutter from AG/CAD. Commenting upon the change of direction Tristar Director, Mr Abu Ahmed says: "Off the back of the recession, the industry became very price oriented and to thrive as a business, we realised that we had to add value for our customers and also extend our capabilities. We didn't want only to invest in Litho, it was a strategic decision to extend our scope and be a one-stop solution provider. Our aim was to look at new ways to create value for the customer; the DYSS and Océ combination have certainly done that." 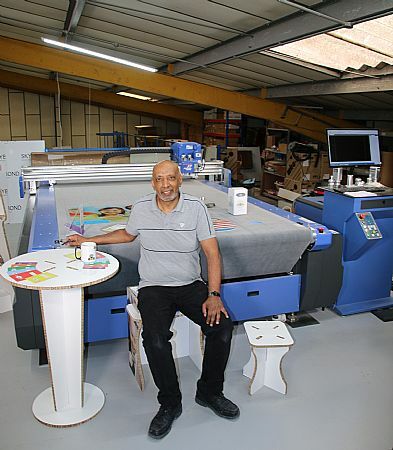 Tristar has invested over £300,000 in large format and finishing which has been further strengthened by the recent addition of a new graphic designer, a large format salesperson and a general print salesperson. 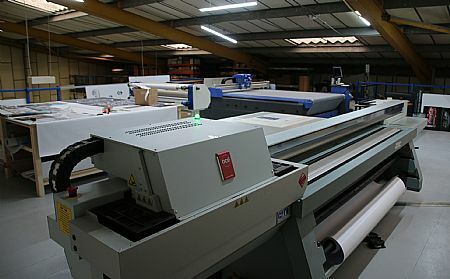 The transition from litho to large format digital has seen the company supplement its traditional services of brochures, booklets and yearbooks for schools and colleges with large format work that has included shop signage, shopping centre displays, confectionery boxes, PoS displays and pop-ups as well as wall-art, box-board furniture and much more. All manufactured on the new DYSS X7-1624C SuperHead digital cutter and printed on the new Océ Arizona 1260GT that were both delivered in October 2016, the company now sees the potential of targeting large format work. 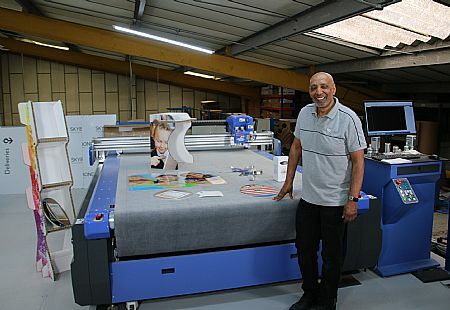 As Mr Ahmed continues: "The Arizona has a 2.5 by 1.25m bed and it allows us to print direct to substrate whether its card, wood, Dibond, Foamex and much more. All of these materials can be processed on the DYSS X7 with its powerful SuperHead that has a router spindle for cutting tough materials as well as tool slots for a variety of knife and creasing/scoring tools." "The ability to print direct to substrate with the Océ and cut absolutely anything on the DYSS is winning huge amounts of new business. It’s particularly pleasing to see our existing small-format customers take advantage of the new capabilities. The new large format department is giving these customers a 'one-stop-shop' for all their print and packaging needs. In addition, we are gaining inquiries and winning new business from retailers, sign makers and small companies that are looking for pop-up banners and signage, shopping centre display units and back-drops to name just a few projects." The digital cutter sector is particularly competitive, but Tristar was adamant in its selection of the DYSS X7-1624C SuperHead cutter from AG/CAD. As a company entering the large format sector, Tristar was swayed toward the DYSS on a few key factors. Firstly, the robust and heavy-duty build quality compared to alternative machines gave Tristar an immediate perception of quality and longevity. Added to this, AG/CAD provided an extended warranty period, which gave Tristar confidence in the product whilst at the same time demonstrating the confidence that AG/CAD has in the reliability and performance of its DYSS range. Another key aspect for Tristar was the comprehensive KASEMAKE CAD software that is provided by AG/CAD.